Journalist Jamal Khashoggi’s sons issued an emotional appeal to have their father’s body returned home during a sit-down with CNN. ‘I really hope that whatever happened wasn’t painful for him, or it was quick. Or he had a peaceful death,’ Abdullah Khashoggi, 33, said during his interview alongside his brother Salah, 35 in Washington on Sunday. His sons say without their father’s body, grieving and closure is not possible. Salah, Khashoggi’s eldest son says, despite the misinformation he has received about his father’s untimely death, he believes Saudi King Salman bin Abdulaziz when he says those responsible will be found out. ‘The King has stressed that everybody involved will be brought to justice. And I have faith in that. This will happen. 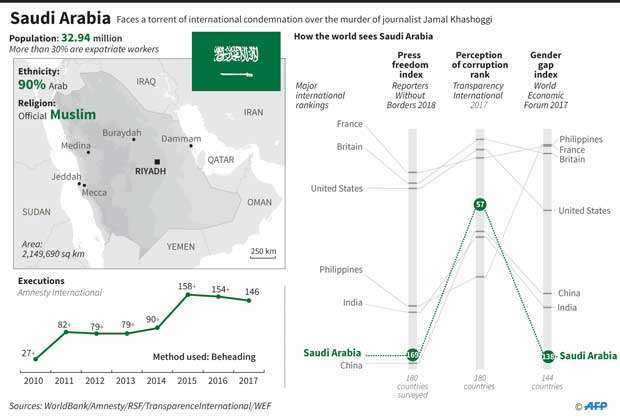 Otherwise Saudi wouldn’t have started an internal investigation...”, Salah told CNN Turkey’s President Recep Tayyip Erdogan has claimed that the order to kill journalist Jamal Khashoggi’s came from the highest levels of the Saudi government. On Friday, it was claimed that Saudi Crown Prince Mohammed bin Salman called Khashoggi a ‘dangerous Islamist’ to Trump officials shortly after he vanished. Salman also told Jared Kushner and National Security Adviser John Bolton that Khashoggi was a member of the Muslim Brotherhood during a phone call a few days after the journalist went missing. ISTANBUL AFP Nov 5, 2018 - Saudi Arabia deployed a chemist and toxicology expert to Istanbul after the murder of journalist Jamal Khashoggi in an attempt to cover up evidence of the killing, a Turkish newspaper reported on Monday. The murder of the Saudi royal-insider-turned critic inside Saudi Arabia’s consulate in Istanbul has provoked widespread international outrage. Turkish authorities have released gruesome details of a killing that President Erdogan has said was a targeted hit.